Original artwork is acrylic on canvas measuring approx 28" x 21"
The Type IX U-boats were capable of great distances. This painting shows an ocean-going Type IXC/40 travelling on the surface in order to get plenty of 'sea miles' under its belt whilst the horizon is clear. 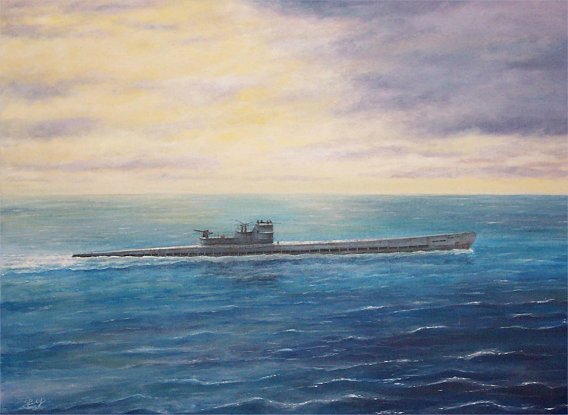 Although very similar to U505 which today lies in Chicago, this painting is actually based upon photographs taken of U534 - the last U-boat to leave Bordeaux at the end of the war. U534 can be visited today in Birkenhead, UK.